Jesse works full time in the store. He’s known for his happy helpful nature and his depth of knowledge. Jesse’s love for paddling came from his father and voyager camps in Ontario. He first learned to canoe on the Canadian Shield in central and northern Ontario where he went on a variety of canoe trips from Toronto to Hudson Bay. 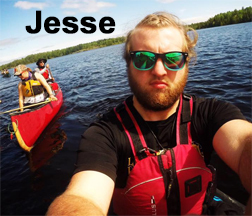 After moving to Calgary Jesse entered the Ecotourism and Outdoor Leadership degree program at Mount Royal University, developing his guiding and kayaking skills to a new level of expertise. Jesse’s goal is for everyone to have the confidence, knowledge, and desire to get outside exploring the incredible world we live in. WFA- 40 hour wilderness medic.